Description:Very cool, probably unique, 1862 patent model of a canister for rifled guns. Because of the spin from the rifling, rifled guns were notoriously bad for canister use. This canister was a war era attempt to improve performance. Civil War Patent Model for "Explosive Canister Shot." Smith Groom of Troy, New York described his "improvement in shot and shell for rifled cannon" as containing powder, wadding, war missiles, wood plug, and conical end. The model is 4.5" long, the brass body being 1.125" wide at the spiral flanges, of which there are four. Conical wooden nose, and a wooden plug inside at the base. The small brass tube in the base serves as the time fuze. The cross section of the shell shows the exploding charge in the base, topped with the wooden plug, with the canister balls placed between the wooden base and the wooden nose. The spiral flanges are, of course, intended to impart spin to the projectile in a rifled gun. There is no indication that this projectile was ever used in combat, and apparently did not go into production, with this model doubtless being the only three dimensional evidence of its existence. 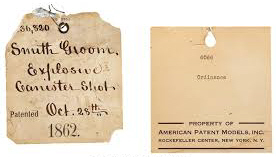 Accompanied by the original 3" x 3.25" Patent Office tag, "36,820/ Smith Groom/ Explosive/ Canister Shot/ Patented Oct. 28th/ 1862" Overall about perfect condition.